World Summit on Sustainable Development 26 August - 4 September 2002. Well for many years I wanted to do this site and now here it is. This is the exhibition that marked me the most in South Africa. I entered and my digital camera jammed (a frist) and I was desperate, could not get it fixed in time . So borrowed a friends camera in dispare( thank you Joao) and went back 2 times as his memory card was much smaller than mine. than unsatisfied I went back with my paper camera and shot some more. Bought the exhibition book that was somewhat disappointing. 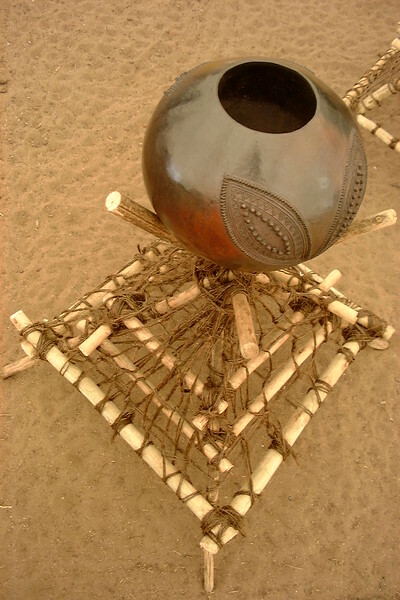 Here it is the essence of tribal Art in South Africa in 2002. I think not much has changed since beside modern and western world influences and maybe more Art from brothers and sisters from the immigrant community from all over Africa that I have always admired most as they seem to be more active in South Africa then the local community. Especially the Zimbabwean Artist that always are the utmost creative. This is in memory of the man who basket wove my kitchen columns (12 feet tall) in South Africa in Iron wire. He never told me he was HIV positive and till he was suddently to frail to work and asked me to take him to the doctor who told me it was too late. The medicine we managed to get him was not enough to save his creative soul.